Every year, without fail, there’s always leftover food or ingredients from Lunar New Year’s dinner. However unexpectedly, there was no additional broth. So armed with a box of CP shrimp wanton, tang orh (chrysanthemum garland) and yellow noodles, I made wanton mee. For the sauce, I combined (vegetarian) oyster sauce, sesame seed oil, mirin and worcestershire sauce in a bowl. 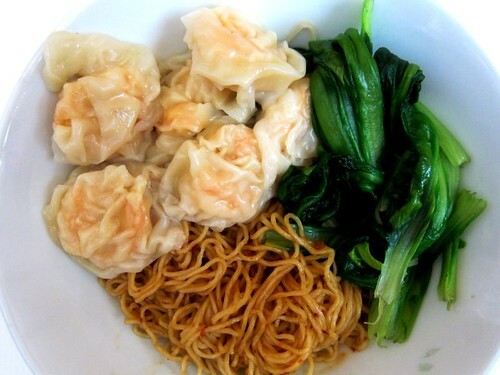 Next, I cooked the vegetables, shrimp wanton and noodles separately in a pot of boiling water. It is important to drain out as much water as you can from the ingredients – this would ensure you don’t end up with a “wet” wanton mee. To finish, you can sprinkle some spring onion, fried onion or green chilli. As I used fresh wanton mee, the cooking process was pretty quick. I think it took me around 10 minutes to prepare a bowl of noodles. Now this is my kind of fast food. Wantan mee dry style is one of my faves. Yours looks delicious! Thanks C! And I greedily gave myself 6 big wantons!